Pardon my running pun, I’ve recently started to call myself a “runner” so I think I’m qualified to use that bad cliche. Over the weekend, I had a discussion with some friends about starting a business online and what it would take. It occurred to me that I’ve been reading other marketers and entrepreneurs writing online so much that I had almost lost touch with what the general public’s perception is of online business. OK, I thought. That’s what most rational entrepreneurs would say. The problem was as a web developer and digital marketer it doesn’t help me. It’s the wrong question to ask. As a web developer, I talk with a lot of people in the very early stages of their businesses. They want a website, because…well…because everyone has one. It’s a given, right? Everyone needs a website. The reason that so many online businesses, web stores, blogs, etc., fail online is because they decide they need a website without first figuring out what the purpose of the website will be. This is a much more important question. The concept of Content Marketing and blogging is one that a lot of people go into with the best intentions. I myself have fallen into this trap many times over (this blog is a perfect example, believe it or not). You fine tune your writing skills, determine who your target audience is, and produce something that is really worth consuming. You are offering genuine value to your audience in a way that no one else in your niche is even coming close to. You are a rock star! Everything is going so good! This is the spike of hope. 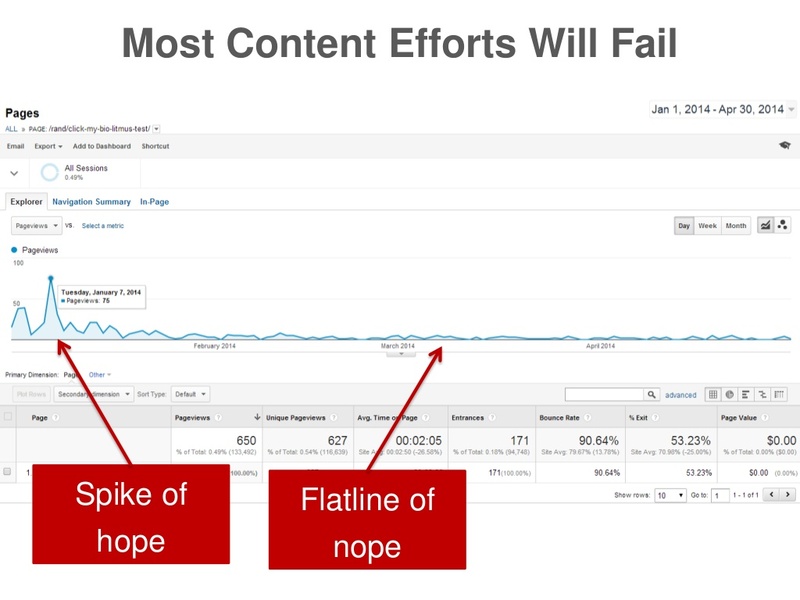 Image taken from Rand Fishkin’s “Why Content Marketing Fails” presentation. I’ve been there. After months of hard work, countless sleepless hours, and several trips to the doctor for carpal tunnel – all that work added up to essentially nothing. This is where most bloggers and website owners give up. They abandon their blogs and websites, and move on to more profitable short-term solutions. But why did they give up? They spent a lot of hard hours writing really good content and putting together a great website. The reason it failed is because the website failed to show it’s value to an audience. This is the conundrum that many new marketers and entrepreneurs face. Content Marketing, Social Media, SEO and Community Building all go hand in hand – but that’s easier said than done. This comic seems stupid, but it’s the absolute truth. Starting a blog or website from scratch is an incredibly hard thing to do. You need to write great content that is valuable to your niche. You need a niche or community to consume this content and determine it’s worthiness. The two are not mutually exclusive. In fact, the trick is, the two are mostly dependent on eachother. It’s really hard to have a community without good content, and it’s really hard to grow from content without a community to consume it. So back to my discussion with my friend about starting a website. The answer “I want a website to make money” seems a little more difficult to achieve. The hard truth is that it’s nearly an impossible goal. It’s going to be hard. It’s going to be depressing. It’s going to drive you crazy. You’ll go weeks, months, maybe years without seeing much growth. Just continue to plug along. If you truly put time and effort into building a website, providing excellent value, and building a community, eventually you’ll become an industry expert. People will start to pay attention to you more and more. There is no quick fix – no short cut. Hard work, sweat and tears are a requirement now. Those willing to stick it out will reap the benefits eventually. I realize this is kind of a downer of a post, but it’s not meant to be. I’m just being blunt and brutally honest with you. It’s incredibly difficult to bootstrap a business or start a website from scratch and make something out of it. It’s incredibly difficult…but not impossible. I had to throw one more running cliche in.